Mingham is a place that probably never existed, but after reading this novel of rural affairs you may well wish it did, together with characters that have a life of their own. Elizabeth Fair’s 1960 novel, recently republished by Furrowed Middlebrow at Dean Street Press, is a true gem of observation of life in a village in the mid twentieth century. Combining characters who attempt to manage, a family which needs organising, an ill fated Fiesta and a big house which forms a bone of contention, this comedy of manners and fate is enjoyable, hopeful and deeply engaging. Some characters make the reader wince, others frustrate, and others just amuse, as this novel proceeds without earthshattering events, but with a certain dramatic flair. I was very pleased to receive a copy to read and review. The novel opens with Hester and her godmother Cecily looking at pictures of a Priory which has been remodelled by its reclusive owner and widower, Thomas Seamark. Certain tactless remarks set up an uneasy relationship between the family and the local squire, as Cecily realises that she must handle the situation better, as well as improving her own relationships with her daughter Maggie and her son Derek. As we see the family in its own setting, we discover Bennet, husband and father, has decided to adopt the role of invalid who must be continually placated and humoured. He is beginning to discover that to be involved in other people’s business he must stage a sort of recovery, with the option to fall back on fragility as necessary. Meanwhile Mrs Hyde – Ridley, while conniving to get as much rent as possible from her memorably named tenant, Chrysanthemum, is anxiously game playing with her troublesome visitor, Mrs Vandevint, with her programme of cheap entertainment. A Rector’s wife, Mrs Merlin, is determined to put on a Country Dancing Fiesta, which is beset with problems. Hester tries to manage several situations, despite Cecily’s conviction that she is still suffering from a broken romance, and tries to encourage despite fixations such as Bennet’s “precious car”, a changeable lord of the manor, and a secret ambition on another character’s mind. Summer weather confounds the best laid plans, and gentle humour pervades the whole novel as misunderstandings, mistakes and general mayhem ensues. This is a novel which can remind the reader of the gentle humour and characters of Austen’s “Emma”, and the sort of ongoing polite battles of Benson’s “Mapp and Lucia”. I appreciated the reality of these characters, was fascinated by the attempted machinations of Bennet Hutton, and loved the humour of the dialogue. Fair’s novel is a finely balanced read of great confidence and maturity, and this final novel of six to be reprinted stands as a really good read. I thoroughly recommend it as a cosy read with some underling power, as Hester discovers the true nature of what she wants from life, family roles and relationships are readjusted, and the minutiae of daily life is examined in a glorious and often telling narrative. While Elizabeth Fair’s six novels have not been well known, she is an author well worth discovering, and I am so glad that they are now available both in paperback and digital formats. In other news, our Big Book Sale went extremely well. We made nearly £350 for Ronald MacDonald Houses for the parents of children who are seriously ill in hospital. As we only charge 50p for each book, it means that we must have sold a few books! Lots of people came, some had refreshments and generally we had an excellent time. It is a lot of effort, but we are recycling books with a purpose as well as getting people involved. Well done D the Book Organiser! This sounds charming, I finished Landscape in Sunlight last night, which I really loved. It was my third Elizabeth Fair book. They are all really enjoyable reads, as I have discovered reading all six. 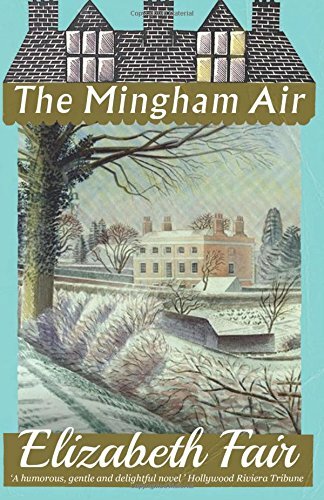 It is difficult to pick a favourite, but certainly “The Mingham Air” shows a really mature understanding and a great sense of humour in descibing her characters.